Luminator Technology Group (Luminator), a leading provider of transit passenger information display solutions and Tolar Manufacturing Company (Tolar), North America’s leading transit shelter manufacturer, today announced availability of high resolution digital smart shelter technology for North American transit agencies. 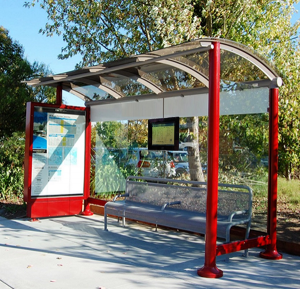 With over 25 years in business, Tolar Manufacturing Company is North America’s leader in the design and fabrication of award-winning, best-in-class mass transit shelters, solar solutions, street furniture and digital/information displays. The company serves the public transportation industry, outdoor advertising companies, municipalities and more with over 500 designs and hundreds of customized solutions.– www.TolarMfg.com – 800-339-6165. The company can also be found on Facebook (@TolarManufacturing), Twitter (@TolarMfg) and on LinkedIn (http://tinyurl.com/TolarMfg-LinkedIn).